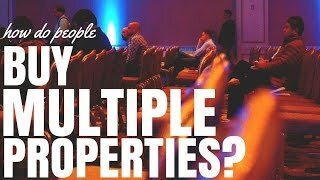 How Do People Buy Multiple Properties? How Do People Buy Multiple Properties? A very small percentage of the Australian population will actually go ahead and purchase more than one investment property and even a smaller portion of the population will purchase more than three investment properties. On the surface it seems very difficult, when we’re looking at the statistics, for any of us to achieve great wealth through owning multiple properties but it can be done and people have done it. So, how do people buy multiple properties? Well firstly, they start with one! Buying multiple properties doesn’t mean that you need to buy 10 properties in the first year (or a hundred and thirty properties in three and a half years just like Steve McKnight did). All you need to do is start with one but when you purchase your first property you need to have your investment goal in mind. Property is a vehicle for success. Just like a car is designed to get you from point A to point B, property is designed to get you from point A to point B financially. You need to know where you want go financially before you hop in that car or start investing in property so that you can buy property that will actually lead you towards financial goals. A mistake that a lot of people make is that they go ahead and they look at one, two maybe three properties in their area and BAM! They buy the properties straight away without doing the finances. These people invest without looking at the cash flow, without researching the suburb in more detail and looking at where it’s going in terms of capital growth. They purchase the property emotionally and they don’t do it based on the financial figures of the property. It’s very important that you start to understand what the properties finances look like and what types of property are going to deliver you the financial outcomes you want. What Type Of Properties Are Right For You? If you’re investing for financial freedom then maybe a positively geared property is going to be best for you. If your goal is to accumulate large portions of equity and wealth very quickly, then maybe properties with high capital growth potential might be good for you. If you want instant equity or maybe you want depreciation then maybe new build properties are going to be more suited to you. Depending on your financial situation and your investment goals the property you purchase is going to be different. How Do We Purchase Our Second Property? 1) You continue to save your deposit in the same way you did for your first property. Obviously, saving a deposit is very hard; I do have some tips here and a house deposit calculator, but you can save your deposit all over again and invest for a second property. If you purchase a positively geared property that spins off extra cash flow then maybe you can use that cash flow to save your deposit even faster? 2) Leverage the equity that you’ve gained in your first property through either adding value or through capital growth that has occurred because of the market. An example: If you have a $300,000 property and it’s now worth $500,000 and your loan’s still $300,000 then there’s $200,000 in equity that is untapped. The banks will allow you to borrow up to 80% of that without incurring lender’s mortgage insurance, so maybe you could borrow an extra $100,000 which takes you up to $400,000 and then you could use that $100,000 for deposit on your second property. After the second property it really just does becomes rinse and repeat it’s a matter focusing on your portfolio trying to maximize the returns that you get in terms of cash flow and capital growth. Then re-investing your profits back into your portfolio to grow it even faster. I have heard from other investors that once you get quite a few properties maybe 3, maybe it’s 5 then the doors swing wide open for you. It’s much easier to get lending and things become so much simpler. But, getting from that 2 to 5 mark can be difficult because you may have reached the peak of your borrowing capacity as an individual. But once you grow your portfolio into size then the banks will start to look at your portfolio and how the portfolio performs to ensure your servicability. It really just has to come down to knowing your financial goals, buying properties that line up with those financial goals and then leveraging new profit that you’ve gained to expand your portfolio or saving more deposit from the income that you’re generating elsewhere as well.